“A Thousand and One Wives”, adapted from a best selling novel by Dan Benaya Serri, is the story of love to the death set in the exotic atmosphere of the Bucharian Quarter in Jerusalem at the turn of the nineteen century. The film depicts the married life of Naftali Siman-Tov, a fifty-year old widower whose two previous wives died under mysterious circumstances. Convinced that a curse plagues his marriages, Naftali refuses to remarry, until pressure is exerted on him to wed a naïve young woman, Flora. 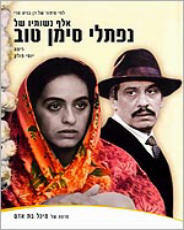 Naftali marries Flora, but his deep fear of the “evil eye” prevents him from fully consummating his marriage. The couple’s life gradually acquires a permanent flavor of unfulfilled love, but something is eating away at Flora, something she cannot identify until a textile dealer, Hamedian, seduces her. Flora does not realize that she is pregnant, but Naftali grows more and more suspicious. Sunk in depression, Naftali, who longs for a child of his own, watches Flora bearing someone else’s child. Divided by their failure to communicate with one another, and still more so by their lack of self-awareness, Naftali and Flora are both trapped within expectations dictated by society and tradition which ultimately transform their enchanted love story into a bitter traged.